Christina and I got married exactly 19 years ago and it still feels like yesterday. We did everything on the same day: a quick saffran in the morning with the close family, a Hindu wedding in the afternoon and an occidental reception afterwards. The interesting part was that the Hindu wedding was not only Indian. In fact, in addition to a pandit, we also have a Catholic priest and they both took turns. At the end, we did the Hindu wedding sacrament (the seven steps) which the Catholic church recognised as a Catholic wedding sacrament. 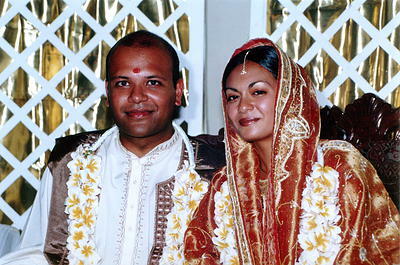 In other words, Christina and I did a Hindu and a Catholic wedding at the same time. After the wedding, we had a great reception which is still quite vivid in our minds. 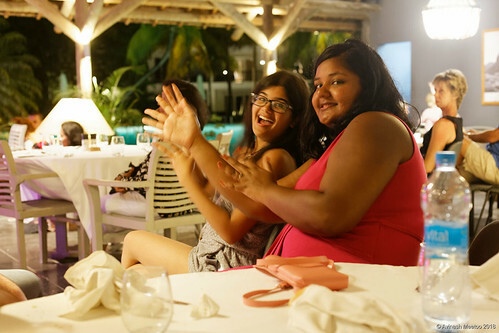 We danced, ate and drank until late at night. 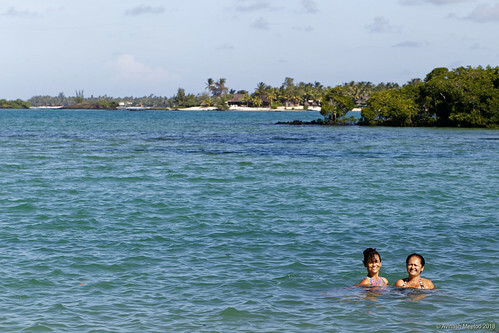 The next day, we took a flight to Rodrigues for our honeymoon. 19 years later, things are pretty much the same. 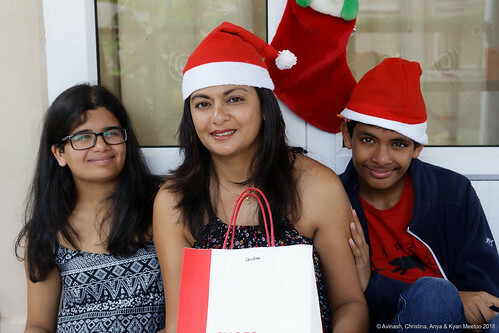 Christina and I now have two big kids, Anya and Kyan, and the four of us are, pretty much, always having fun. In fact, we are well-known among our circle of friends and relatives are formidable partygoers. For us, singing (the séga) and dancing (everything!) are fundamental parts of our lives. And, to be honest with you all, I think that we’ll always keep this spirit and life philosophy. 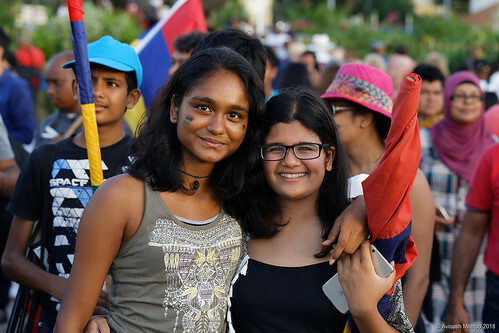 Here is a small selection of photos we took during important events in 2018. You’ll find all our photos on Flickr. 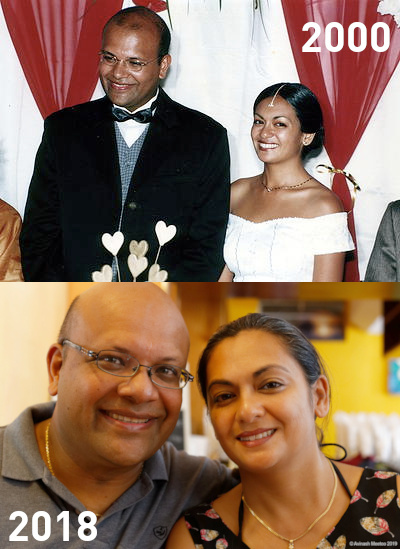 8 January: We celebrated our 18th wedding anniversary. Time flies! 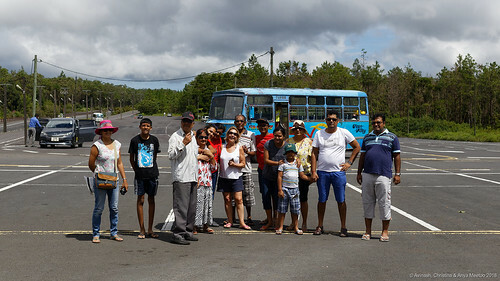 24 February: We rented a bus and toured the south of Mauritius with my dad’s family, Matchuk & Co and Jinny & Co.
1 April: We went to Bras d’Eau for Easter with Christina’s family. The sea there is absolutely fantastic. 5 May: Christina and I were in Athens. 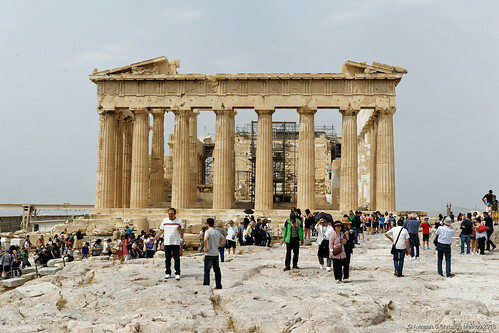 We loved the food and, of course, the historical monuments such as the Parthenon in the Acropolis. 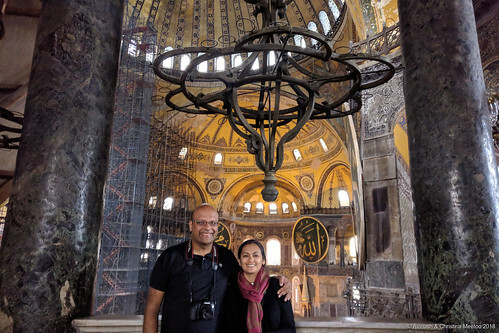 11 May: Christina and I discovered a fabulous city, Istanbul. Here we are in Hagia Sophia, a church which became a mosque then a museum. 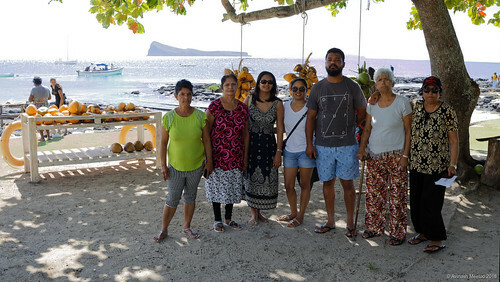 15 July: An outing with Christina’s family in the north, most notably at Cap Malheureux. 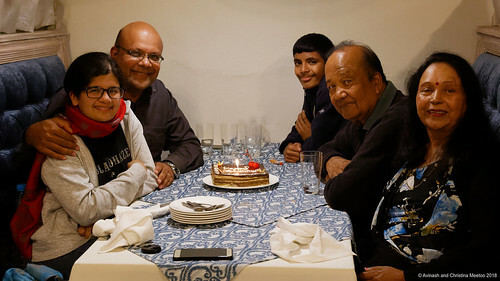 25 August: Christina’s birthday celebration in an Indian restaurant in Ébène. 4 September: Anya wanted to celebrate her 16th birthday with her uncle, Christian. 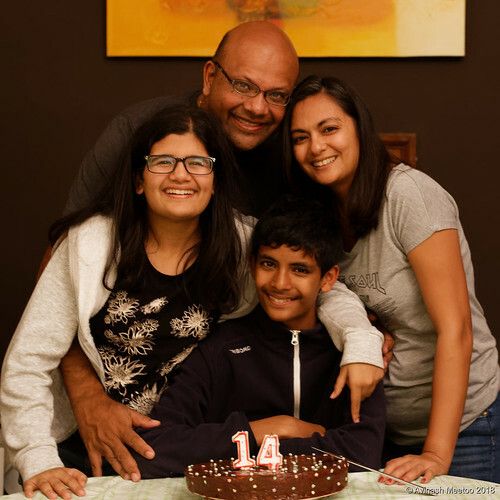 15 September: Kyan turned 14 and we had a party at home. 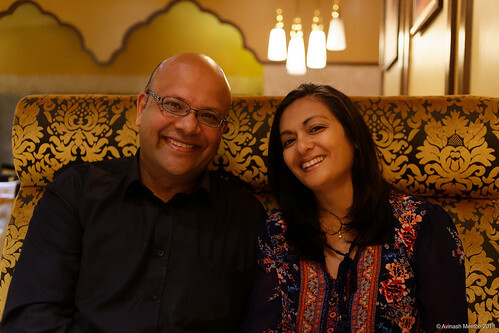 25 September: On my 45th birthday, we went to Dragon Vert, one of our favourite Chinese restaurants in Mauritius. 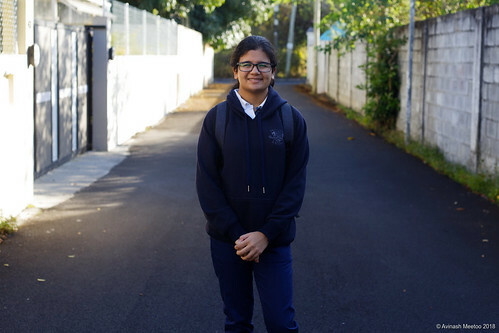 1 October: Anya starts her Form V / Cambridge School Certificate exams. 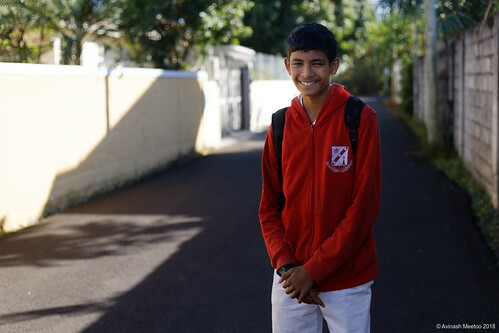 8 October: Kyan starts his Form III / Mauritius National Exams. 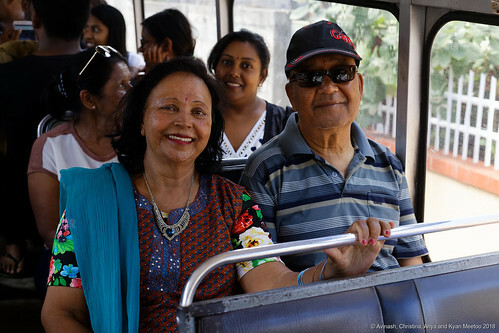 25 November: Another picnic in the bus with my mum’s family. 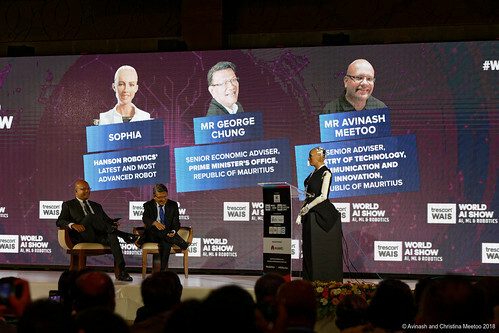 28 November: Georges Chung and I speak with Sophia, the robot, during the World AI Show in Mauritius. 20 December: At the Ravenala Attitude hotel with Juju and Stéphane during Cilida, the cyclone. 25 December: Father Christmas has come during the night and has left a few gifts for us! 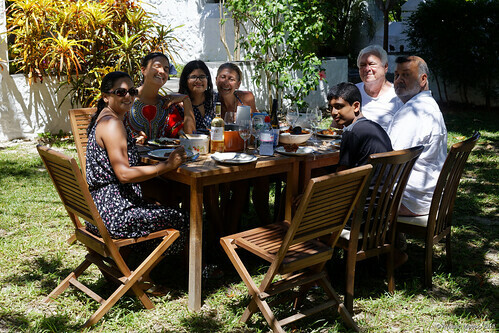 28 December: Lunch with Matchuk and family in Péreybère. I started composing music when I was around 16 years old. At that time (1989! ), the technology I had access to was quite primitive compared to what I have today. But I still managed to create some good tracks using my trusty Commodore Amiga 500, Music-X and Bars & Pipes sequencers and my still working Kawai K4 Digital Synthesizer. Today, of course, I have move to greener and better pastures and this is what I want to share with you in this post. To start with, from my humble beginnings on the Amiga with Music-X and Bars & Pipes, I’ve moved to Cakewalk (on a PC) when I was studying in France, then to Emagic Logic Audio (still on a PC), then Apple Logic (I had to get a MacBook! 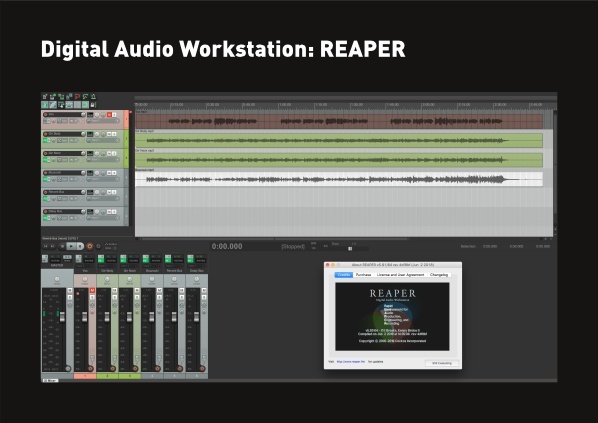 ), then Apple Logic Pro X (on an Apple iMac) and now Cockos REAPER (still on the iMac but nothing prevents me to move to a PC if needed as I have made it a must to cut my dependence on Apple). … which brings us to the three keyboards I have. 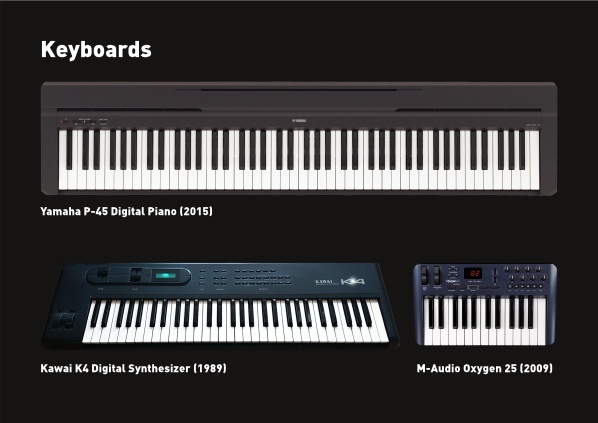 The first one (chronologically) was the Kawai K4 Digital Synthesizer which my parents bought my brother and I around 1989. It was love at first sight for us even though there were better synths at that time. Thirty years later, the sounds are dated but the keybed is still very good (with note on and note off velocity and channel aftertouch). Today I am using the K4 as the master controller of my setup. A few years ago, I also purchased an M-Audio Oxygen 25 for the rotary knobs but the two octaves are too limiting. Today I only use it sparingly. It will most probably end up in one of my kids’ room. A few months ago, I also got my first digital piano: a Yamaha P-45. I love it. We all use it pretty much every day, especially Anya, but it’s in our living room and not in my studio. I do bring it in my studio from time to time though but I have to say that the K4 is good enough. 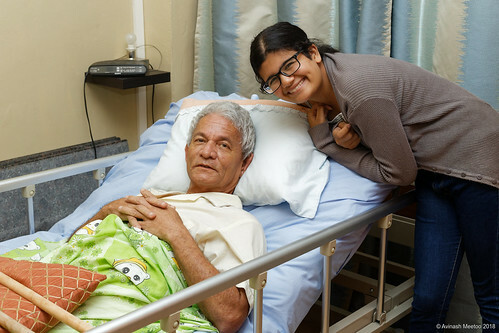 When Anya finished CPE, we gave her a Valencia 100 acoustic guitar. 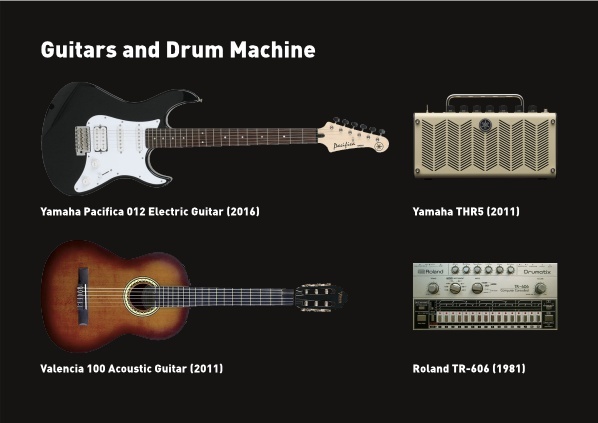 Funnily, I was the one who got hooked on guitars and, today, I am a decent guitar player (my brother, Ashvin, who is a pro tells me I’ve reached “Lower VI” level…) Two years ago, we took the plunge and got a Yamaha Pacifica 012 electric guitar and a THR5 amp simulator. To be honest, we don’t use them that much but we really have to beef up our electric guitar skills. I say “we” because Kyan has become a good guitar player as well. Aha. The venerable Roland TR-606 wsa gifted to me by the dad of a student. They had invited us to have dinner at their place and, when I told them I was a musician, the dad brought me the TR-606 which he had got from a past customer as payment (he was an electronics guy). I don’t switch on the Roland too much these days as I have samples of it but I’ll never let it go… It’s a museum piece. Having covered hardware, let me move to software. I love virtual instruments. More than hardware synths or samplers in fact. The computer scientist in me knows that an Intel processor is way more powerful than what exists in synths. For acoustic sounds, my choice is XLN Audio. I have Addictive Keys for my grand piano (and I have to say it sounds better than my Yamaha P-45). 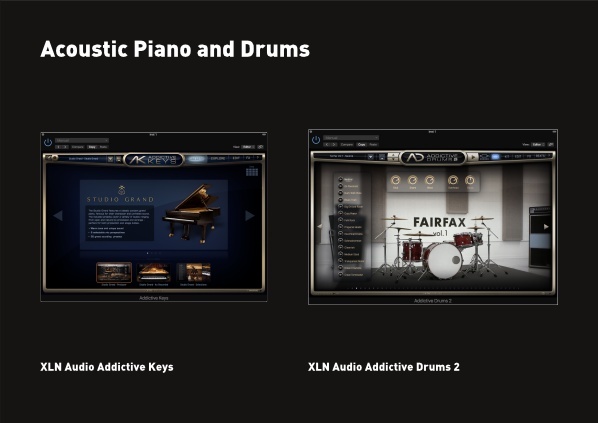 For acoustic drums, I own Addictive Drums 2. I suppose my next album, the fourth one, will feature these quite a lot, especially Addictive Drums. On my 3rd album, Turn Around, I was still using the Drummer in Logic Pro X. 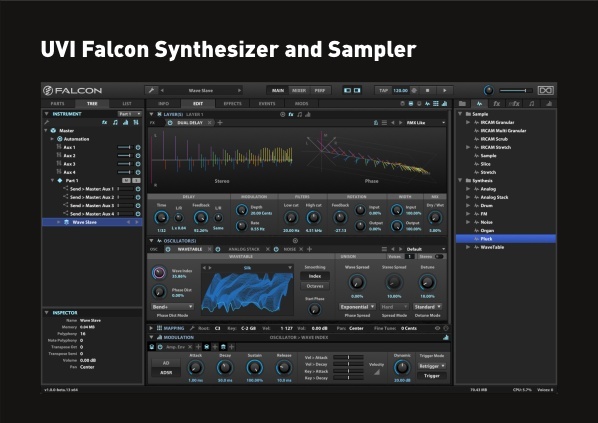 For synth and sampling, I have the best: UVI Falcon. I got Falcon only last week and I have been discovering the presets (which are quite amazing). Interestingly, a few days ago, Christina asked me about how Falcon works and I spent one hour explaining analog and FM synthesis to her while demonstrating the creation of simple sounds in Falcon. And, believe it or not, everything worked! Falcon is deep but logical. I love this! 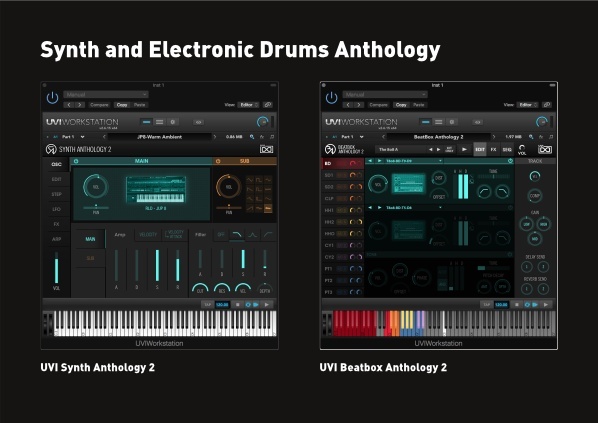 Prior to getting Falcon, I had purchased UVI Synth Anthology 2 and UVI Beatbox Anthology 2. 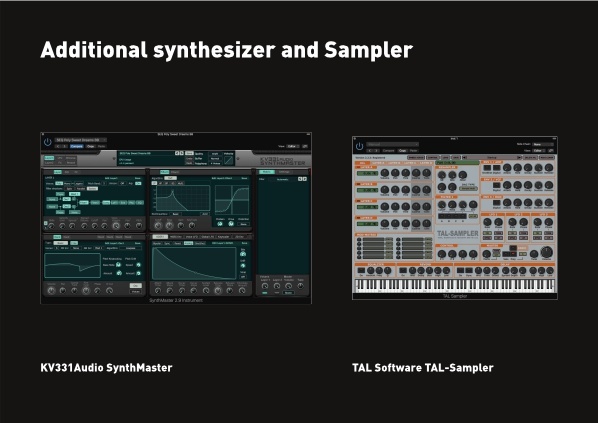 Both are complex sound libraries of legendary synths and drum machines. I was using them in the free UVI Workstation which has limited editing capabilities. With Falcon, I can now edit every single aspect of the sounds if needed. I love that UVI sound libraries are compatible with Falcon. I also own Analog and Digital Motions, two additional Falcon sound expansions. They are both wicked! 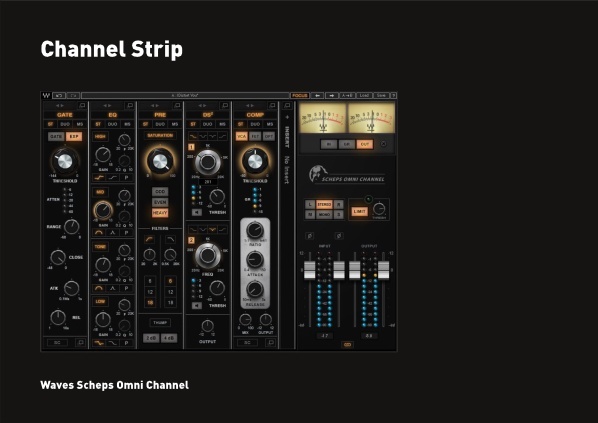 The channel strip which I use on all my channels is the Waves Scheps Omni Channel. It is powerful, sounds great and is easy to use. The preamp has a nice distortion, the EQ is easy to use and the compressor very effective as it’s basically a VCA, a FET and an Optical compressor in one. The presets by Andrew Scheps are very good and can serve as inspiration. I use the Waves H-Reverb and H-Delay plugins pretty much on all my tracks. They both sound great and are easy to use. 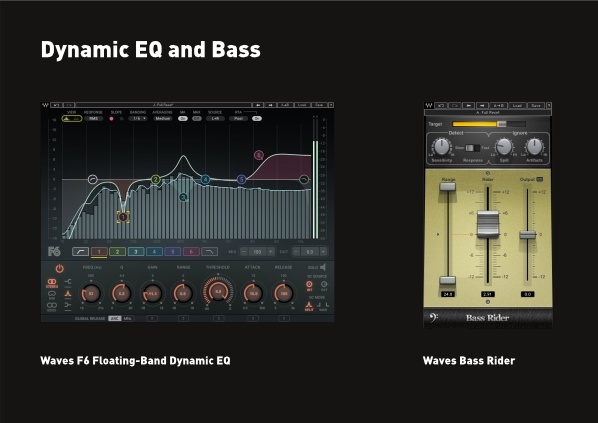 These days, I tend to use the EQ and the compressor in the channel strip. But in case I need standalone ones, I have H-Comp and H-EQ. 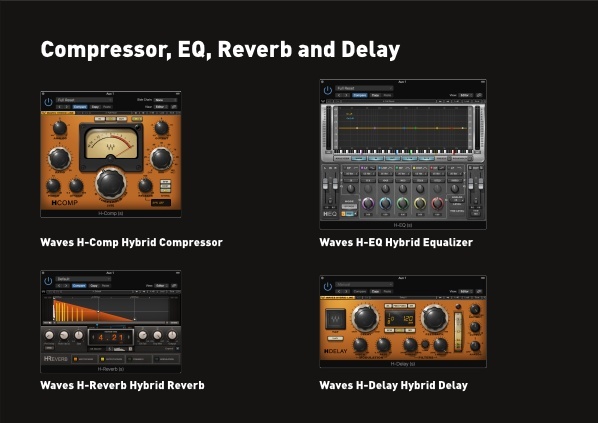 I got all four plugins in the H-Series Bundle. I have acquired the F6 Floating-Band Dynamic EQ but I have not used it yet on any track. 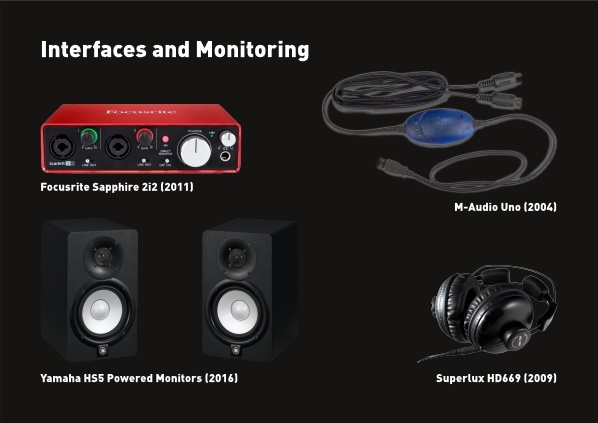 But I know that I am ready for any complex audio correction if needed (possibly at the mastering level…) I suppose this will be needed more on acoustic instruments and vocals. We’ll see. I also have the Bass Rider. It’s designed for bass guitar but also works great on synth bass. For mastering, I have opted for Vitamin Sonic Enhancer for sprinkling the magichigh-frequency dust on the song. 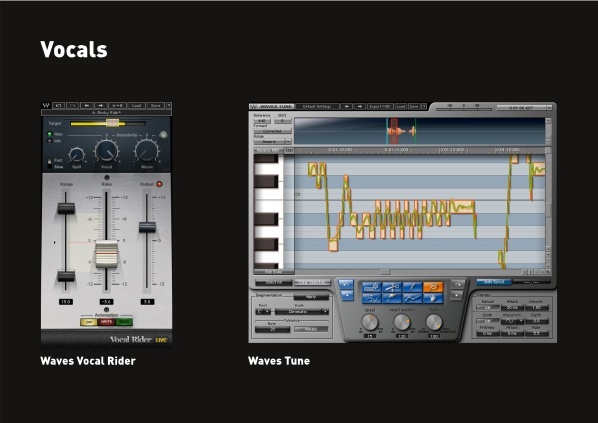 Waves Center is also very powerful for controlling the stereo image of the song and making it sound more professional. 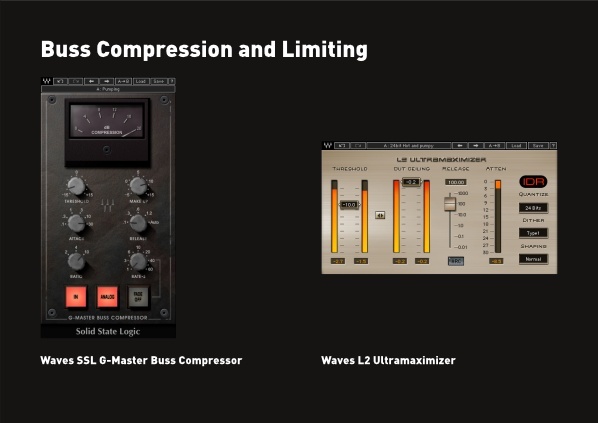 At the end of the chain, I use the Waves SSL G-Master Buss Compressor, THE GLUE! This plugin makes everything seamless. It’s a joy to use (as it has a few knobs) and sounds great. For making sure that no clipping can ever happen, I use the L2 Ultramaximizer at the very end. I am a fan. I make sure that mixing and mastering are well done and attenuation is only a few dBs at most. 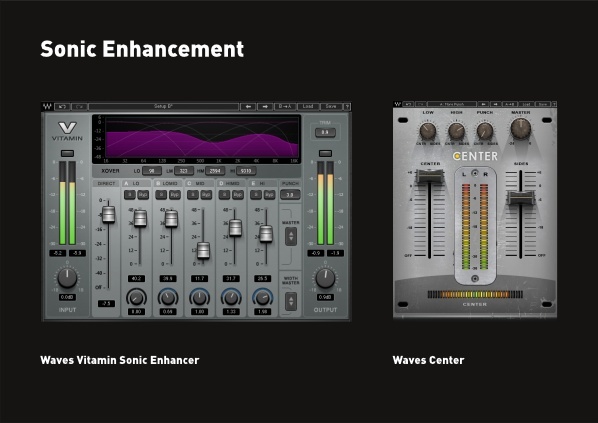 I also use two essential Waves metering plugins. First, I tend to use the Waves Dorrough Stereo plugin a lot when recording and mixing. I use it to make sure that I never have signals which are too hot. I also use it to make sure that my music is dynamic. For me, as someone who despise the Loudness War, I love listening to unclipped and dynamic music. 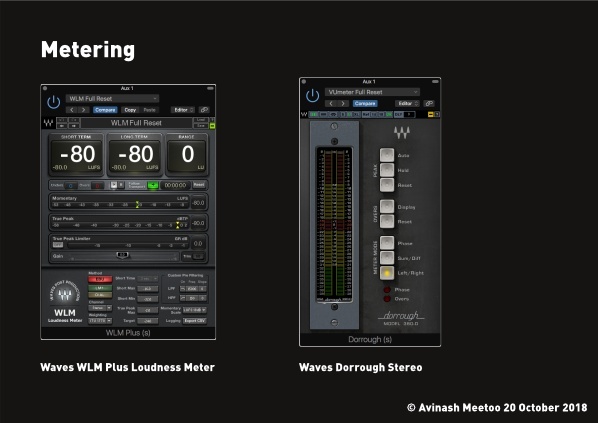 Finally, the WLM Plus Loudness Meter allows me to master in compliance with AES EBU R128 standards. Listen to my three albums online: Turn Around (2016), So Logical (2004) and My Contribution to Art (1995-2000). Enjoy. And don’t hesitate to leave your feedback.